Derbyshire wicketkeeper Harvey Hosein takes a smart catch. Former England wicketkeeper Jack Russell has been hired to boost Derbyshire’s chances of success during the forthcoming cricket season. For he has held personal coaching sessions with the county’s glovemen, Gary Wilson and Harvey Hosein, at The 3aaa County Ground. The 53-year-old Russell, who appeared behind the stumps in 54 Test matches for England before retiring from the game in 2004, is offering coaching support and guidance to both of Derbyshire’s wicketkeepers ahead of the new season, which begins in April. 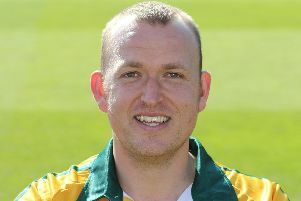 During his playing career, Russell played alongside the club’s new director of cricket Kim Barnett in all four of his Test match appearances for England, and he was also at Gloucestershire with Barnett from 1999 to 2002. Russell enjoyed a fruitful 23-year career at Gloucestershire. In the coaching session at Derby, Wilson and Hosein worked on keeping drills, both up close to the stumps and also further back, as well as reaction work and catching drills.